Toddlers love to spend time with their parents, and physical contact is important for them to bond properly with Mum and Dad. That's why spending some time getting physical is so important – it helps them develop better motor skills, and also encourages a closer family relationship. Whether you make up games together or follow a more prescribed format, the important thing is to have fun! Children of all ages love to move. If you put on a DVD or switch on the radio, immediately your child will start moving to the music. It's a natural reflex, as in-built as smiling or learning how to babble. 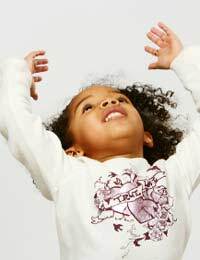 Toddlers in particular love to practice their newfound movements. Through creative movement of any kind they learn about the space around them, helping them to develop better motor skills and tune in their hearing and other senses. Teaching them how to move, and moving with them, also helps to channel their energy, promote listening and understanding skills, and encourage their innate creativity. Best of all, teaching creative movement at home is a great summer activity – especially when it's raining outside and you want them to burn off some of their boundless energy! Rhymes are fun for little ones, even simple words (pig - big for example, or ham – jam). Take turns saying rhyming words out loud, and have the children act them out. The child who uses the most energy - and is the most creative - gets to set the next rhyme. This exciting game is as easy as it is fun, and can work one-on-one although the more children the merrier. Sit the children in a circle, place a soft toy on everyone's lap, then start off telling a story. Act out all the characters and get as wild and crazy as you can. After two minutes, it's the next person's turn to continue and show off their story-telling skills. Everyone will have a chance to be “on stage” and be the centre of attention for a while, which is why it works so well. Sometimes an egg timer helps keep the peace – you can set it for less than two minutes if the kids' attention appears to be lagging. Hopefully the children's stories will revolve around their own soft toy and make it easier for them to be involved. Involve other props you find at home if possible – let them choose what they want! Bring Out the Pots and Pans! Small children of all abilities will love this game. Invite them into the kitchen to select some appropriate pots, pans and other items to encourage them to get loud. Tupperware containers with wooden spoons are particularly good for kids who love drumming; two saucepan lids work well as cymbals – if you can stand the noise! If you have several children, get them each to imagine a real musical instrument they would like someday to play. Then stand in a circle and ask each one to talk about the instrument and explain how it works. Finally, put some music on and have everyone jam to the tune. When the children are especially full of beans and need to release as much energy as possible, stage a pretend marching band. Have each child grab an outfit from the dressing-up box to make the image complete. If the weather's nice, play the “music” outside for a spell. If not, keep it indoors. One nice thing about this game is that it can encourage the concept of loud and quiet. Have them play their music very loud, then at a moderate level, then so quiet you can barely hear it. Noticing the differences in sound will contribute to their understanding of the concept. Obviously, this game can be played inside the home - or in the garden. Involving your children in creative movement can be great for both you and them. Have fun and let them guide you. Make the most of what you have at home – pots, pans, pillows, soft toys and blankets. Appreciate what they do and give them lots of positive reinforcement. You can't help them to build their motor skills, hand-eye coordination as their self-esteem – and they'll just love being with you!